Una villa bellissima in una magnifica posizione appartata con spettacolari viste panoramiche sul litorale. Situata sulle colline, a 20 minuti da Faro, una posizione perfetta per le spiagge e la campagna. La villa è costruita secondo gli standard più alti e ci sono una bellissima piscina riscaldata e una terrazza accogliente con barbecue per mangiare all'aperto. Bagni privati di marmo per tutte e 3 le camere da letto più stanza doccia separata. Grande cucina con zona pranzo e famigliare, lavastoviglie, frigo/freezer e stufa a legna. Due stufe a legna più radiatori a olio per i mesi più freschi, camere climatizzate/riscaldate più una piacevole brezza estiva nei mesi più caldi. TV satellitare, DVD, radio/CD, telefono e Internet a banda larga. Superb villa in lovely quiet location. 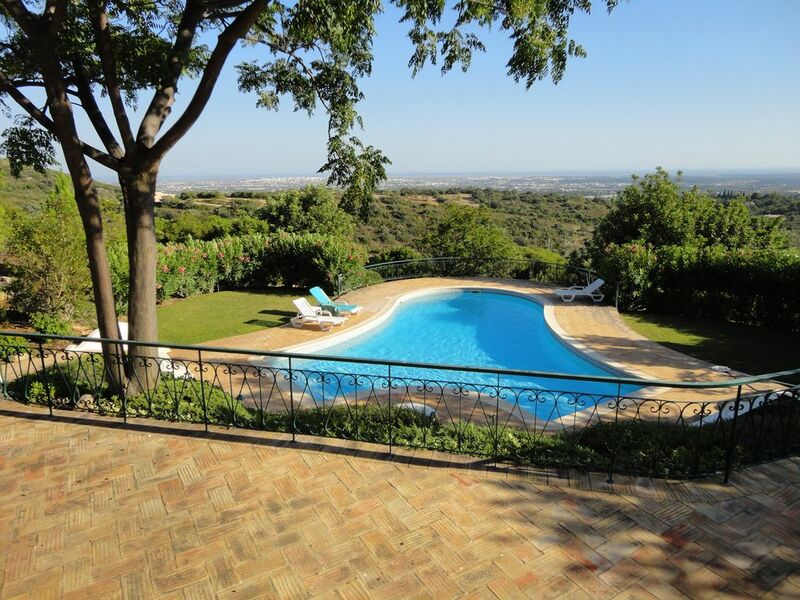 Clean, well presented villa in a lovely quiet location with stunning views. Pool (heated) is superb and the gardens surrounding the property give complete privacy. Owner was very responsive to a small question at the start of the holiday. Will definitely be back! Beautiful Hacienda with fabulous pool! We had a fantastic stay in this lovely property, the kids were in the pool all day. It’s incredibly quiet and private yet within walking distance of Santa Barbara da Nexe and it’s great restaurants. The air conditioning in the bedrooms was greatly appreciated. The view out across Faro and the coast are breathtaking, equally at night when the distant towns are lit. Owners very friendly and accommodating. Nous avons profité de cette splendide villa super équipée avec piscine. A recommander chaudement. Un seul petit bémol : pas de douche près de la piscine. Our family of 5 stayed in this wonderful villa for 10 days. The house is great and well maintained, the pool was heated and warm and overall it was a fantastic holiday. The villa is in an outstanding location - it feels very remote and private however it is just a short distance to the local village where you will find a couple of supermarkets, local bars and good restaurants. La Piazza is definitely worth a visit as is Restaurant A Canga and Alagaos. Julie's bar is a great spot for a G&T! We did have a couple of small issues and the maintenance team could not have been more responsive - even on a Sunday. If you are on the hunt for a thoroughly relaxing holiday in a traditional Portuguese village this villa should be on your short-list. The villa is very well kept and beautifully furnished with the most amazing pool and lovely gardens. It is situated quite high up and the final approach road is quite narrow but the views over Faro and the coast are stunning. Parking is easy and it is all very quiet. We were there in February in the worst weather the Algarve has seen in years, so were very grateful for the lovely wood stoves and large supply of logs. In good weather it must be lovely. David was very helpful before we left and the management company soon sorted out a problem with the TV. The alarm system can be a bit tricky. We found that you needed to press the keys firmly. Molti ottimi ristoranti per apprezzare una vasta gamma di cucina, grandi mercati di pesce e mercati generali a Loule, Faro, Olhio, Tavira, Quartiera, ottimi parchi acquatici, go-kart, tennis, equitazione, vela, pesca, windsurf, estuari con uccelli protetti e campi da golf. BOOKING NOTES:- 20% DEPOSIT to confirm booking, balance 4 weeks before departure. £150 RETURNABLE DAMAGE DEPOSIT,returnable 2 weeks after the end of your stay IF POOL HEATING is required there is a fee of £150.p/w CREDIT CARDS ACCEPTED PAYPAL ACCEPTED Changeover Day: Generally Saturday but other days possible. NOTES on prices: Prices are for the property per week in UK Pounds. POOL HEATING is £150 per week.